Welcome to Ruby Star Airpark! Southern Arizona is home to a world class airpark that offers private pilots, equestrians, and their families 300+ flying days, sparkling sunshine nearly all year round, plus the combination of a remote setting within close proximity to all amenities in nearby Tucson, Green Valley, & Sahuarita Arizona. Ruby Star Airpark is an easy 12 minute drive to Green Valley & Sahuarita where all of your shopping, medical, and entertainment needs can be fulfilled. For commercial flights, Tucson International Airport is just 30 minutes away. With the Sierrita Mountains to the west and the Santa Rita Mountains to the east, Ruby Star Airpark is blessed with spectacular views, stunning sunsets, and amazing sunrises. At an elevation of 4,000 feet, daytime and nighttime temperatures are cooler than nearby Tucson and much cooler than Phoenix Arizona which is approx 130 miles to the north. This 640-acre pilot oasis is made up of 7.69 acre++ home sites that are large enough for your custom home, enclosed hangar, tie-down space, horse corrals, and much more. 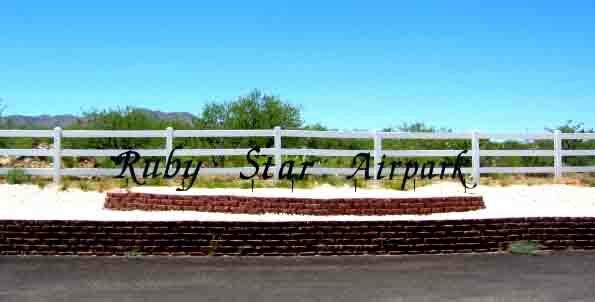 Ruby Star Airpark boasts a 4,300 foot asphalt runway (VFR and day-use only) and excellent year-round flying conditions. Surrounded by thousands of acres of State Land, horseback riding becomes reminiscent of the old west. Add all custom homes, proposed amenities, an abundance of horse trails, and some of the friendliest, most experienced general aviation neighbors you’ll ever meet, and Ruby Star Airpark becomes the destination where you’ll want to hang your pilot’s hat as often as possible.